The village of Jackson, New Hampshire offers the quintessential, charming, New England experience that travelers seek. There are several fine restaurants and shops within 1 1/2 miles of the inn. 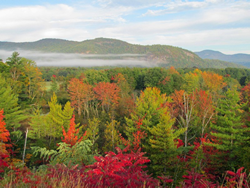 Jackson and the classic White Mountain villages of Bartlett, Glen, Intervale, and North Conway have been a favorite destination for winter and summer visitors for over 200 years. Traditionally, winter arrives in this area around the first of November and often stays through March and sometimes into May in the higher elevations. Several golf courses, hiking, biking, and fly fishing are all a stone's throw away. Mount Washington is 15 minutes from the inn and North Conway shopping is only a 10 minute drive. Come summertime, families can enjoy the popular amusement park, Storyland, just three miles from the inn. Enjoy the friendly, relaxing setting of Jackson Village while being conveniently located to all that the White Mountains have to offer. If you need some extra assistance or would like some recommendations, or if you'd like us to assist you in planning your vacation, please use the contact form below and we'll get right back to you with more information specific to your request.